Fourth of July is one of my favorite holidays. I love the fireworks, the warm summer sun, the cool night, and the beautiful fireworks. I love to have a little something sweet to complete the delicious summer meal we all enjoy. 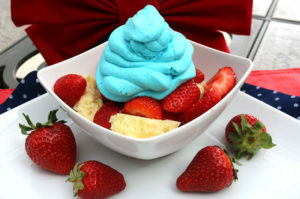 So I was very excited to come across this sweet and simple red, white and blue themed 4th of July dessert. Thank you to Two Sister’s for such a delicious and simple treat to complete my meal plan today. You can find this incredible recipe on the Two Sister’s site. It may very quickly become my favorite summer treat. Strawberry Shortcake is almost always a crowd pleaser, especially in a household filled with strawberry lovers like ours. So it only makes sense to create this delicious homemade update perfect for the holiday. I hope that you and your family have a special and safe fourth of July. We will have a very sweet one with the help of Two Sister’s special treat! This entry was posted in Food & Recipes and tagged 4th of july, desserts, food, fourth of July, recipes, red white and blue, strawberry shortcake, sweet treats, the boys store, two sisters on July 4, 2018 by Lacy.